Wow! Amazing deal. The guys at 1SaleADay have done it again. 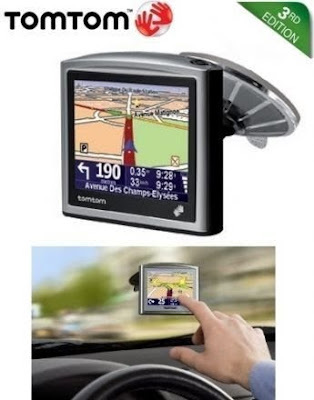 Get a TomTom, normally priced at $199.99 for just $59.99. I'm kicking myself right now because I got the exact TomTom model for my dad for his birthday just a month ago. I don't regret getting it for him, but the money savings. Oh well. I can tell you from experience, though, that these make a great gift, especially for older men. My dad is one of those old school 'Don't ask for directions, I know where I'm going!' kinda guys. He'd never buy a nav system himself. The trick was to buy it for him, set it up for him in his car and punch in the data for the directions of his next trip. Then TomTom would tell him where to go and it'll be like music to his ears. Navsystems really make driving easier and let you focus more on the mechanics of driving rather than having to keep an eye out on the road. TomTom ONE 3rd Edition 3.5" Slim Portable Touchscreen GPS Vehicle Navigator with Turn by Turn Spoken Directions & Real Time Traffic Capability - USA Model & Works in Canada. Find your way the easy way. TomTom ONE's distinctive design puts a full-size touchscreen and the power of GPS in a slim, lightweight device. Switch on and go right out of the box. TomTom ONE is the world's number one selling portable navigation device. The TomTom ONE 3rd gives you brilliant basic GPS navigation, plus some really helpful advanced features to make your day on the road easier! You can choose fastest or shortest route, bicycle or walking route, or limited speed routing to avoid freeways. You can even tell the TomTom ONE 3rd what time you need to arrive at your destination, and choose your route accordingly. The ONE 3rd mounts quickly to your windshield with a simple heavy-duty suction cup mount, which is included. The TomTom is the perennial leader in handheld navsystems. Most of the other brands are just following their lead. Don't miss out on this truly great offer. As with all 1SaleDay deals, you've got less than 24 hours. The clock is ticking!